I remember vividly the arrival day of this "wicked visitor",which was one faithfully Monday;25th March, 2002. It took this "wicked visitor" 3 days to settled on the soil of Dagbang capital,Yendi. A day that Dagbang was heard in the news for the bad reason,a day that marked the retrogression of our beloved Kingdom;once respected Kingdom in West Africa was brought to her knees.A day that turned the whole of Dagbon to a cemetery. This "wicked visitor" downgraded Dagbang to her competitors and eroded the reputation she earned since 1416 when the Dagbang Kingdom was founded and existed since! This 'visitor' lived with the good people of Dagbang for almost 17 years amidst prayers for his departure. His continuous stay in Dagbang left many dead,gave birth to orphans and windows,kept many on exile,left many houses burnt;that left people homeless,he broke many marital homes,aged long friendships were not spared as many friendship got broken,his presence turned Dagbon from the moment of joy and peaceful coexistence to the moment of sorrow and hatred. A visitor whose stay in Dagbang planted enmity among her people;who once had been brothers and sisters. It was on 21st November,2018 that,his departure from our Kingdom was announced to the world,which many doubted but with Allah's mighty and wisdom it came to reality. The departure of this "wicked visitor" didn't happened without skirmishes;yes,Dagbang indeed went through difficult times but the good people of Dagbang being fade up with this 'visitor',defied all odds to see to his departure from our soil. 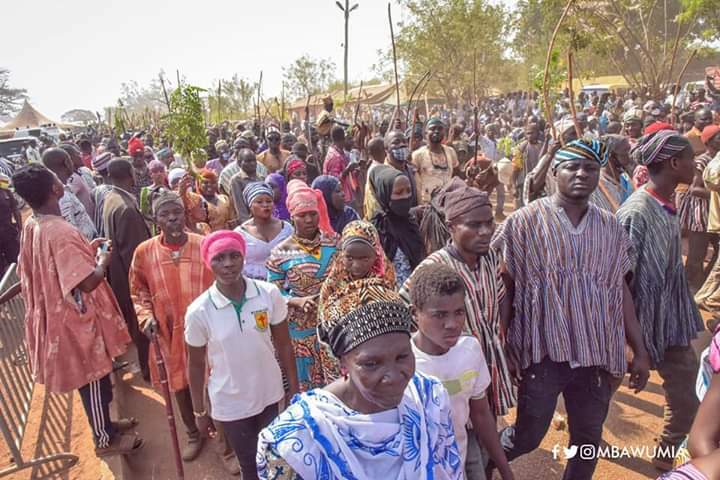 Putting his luggage together for departure was not easy,but sons and daughters of Dagbang said;"this is the time and no room for negotiation anymore"
This 17-year-visitor finally parted ways with the people of Dagbang on Friday,18th of January 2019; a day every Dagomba shall remember in his/her life and feel proud to be called a Dagomba. This was the day we came together as ONE PEOPLE again and waved the "wicked visitor" bye-bye with joy and happiness on our faces. On this very day,we accepted peace and resolved to embraced it. On this same day,"ALASANI and FUSHANI" were called Dagombas,not "ABUDU and ANDANI" and we have resolved to hold onto it for the growth and development of our beloved Kingdom and her people. This very day put Dagbang back on her feet;Yaa Naa was named to take up authority of Dagbang in the person of Yaa Naa Abukari Mahama II. This is a day,historians of Dagbang had written on history our books with indelible ink. The journey to see the departure of the 'visitor' hasn't been easy but with Allah's mighty and the wisdom of the 3 Eminent chiefs committee it became possible,may Allah bless their reign and grant them good health. Same goes to Former President Kufour for constituting the committee that brought us this far as a people. Also to the current government and past governments for supporting the committee to be able to chalked this enormous success for Dagbang. Thanks also goes to anybody who contributed towards the peace process in Dagbang and to the good people of Dagbang. May Allah be pleased with the souls of those we lost on our journey to peace in Dagbang and grant them Jannah!